NETWORK FINALS: The NBA FINALS game adjusted to 6.3, and the pre-game JIMMY KIMMEL LIVE to 0.9. CABLE HIGHLIGHTS: The NBA Finals didn’t hurt MTV’s JERSEY SHORE: FAMILY VACATION, up a robust 0.23 from last week to 1.21, with EX ON THE BEACH up 0.11 to 0.50. On Bravo, SOUTHERN CHARM gained 0.04 to 0.50, and the just-canceled IMPOSTERS was down 0.03 to 0.11. On HGTV, FLIP OR FLOP jumped 0.13 to 0.39, HOUSE HUNTERS rose 0.06 to 0.34, and HOUSE HUNTERS INTL ticked up to 0.31. Food Network’s BEAT BOBBY FLAY climbed 0.04 to 0.32. History’s SWAMP PEOPLE slipped 0.04 to 0.28. Comedy Central’s THE DAILY SHOW again found itself in the Top 12 at 0.28, and in “real” cable news, Fox News’s TUCKER CARLSON TONIGHT had the lead at 0.27/0.40/2.6M, with MSNBC’s RACHEL MADDOW SHOW at 0.26/0.41/2.5M, and CNN’s ANDERSON COOPER 360 at 0.20/0.26/800K. On ID, EXTREME MEASURES was steady at 0.25. We’s GROWING UP HIP-HOP gained 0.03 to 0.20. Tru’s CARBONARO EFFECT held at 0.14, and INSIDE CARBONARO ticked up to 0.12. POP’s IMPACT WRESTLING ticked down to 0.06. 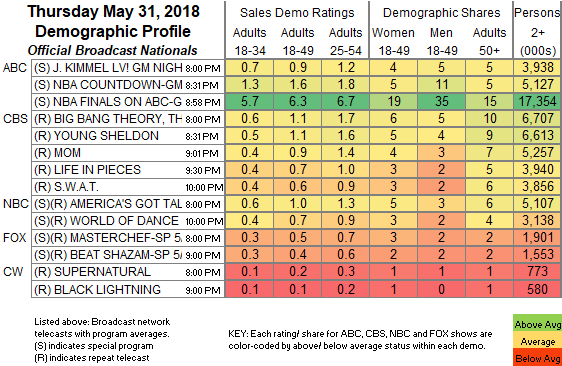 TV Land’s NOBODIES was at 0.06/0.05, down from last week’s 0.11. 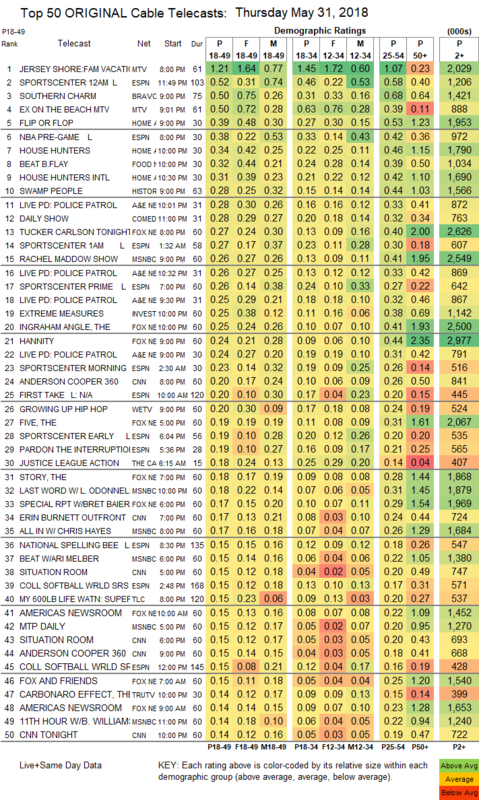 The low-rated night helped E!’s CITIZEN ROSE to hit the chart, despite a 0.02 drop to 0.03.